The recent Easter break gave dusty Cairenes their first chance to hit the road, head to the beach and get their first taste of sun, sea and sand, leaving them hungry for more. It isn’t quite Sahel Season and there aren’t too many weekend-extending holidays from now till then, but we do have a whole host of events right here in the capital to keep you busy. 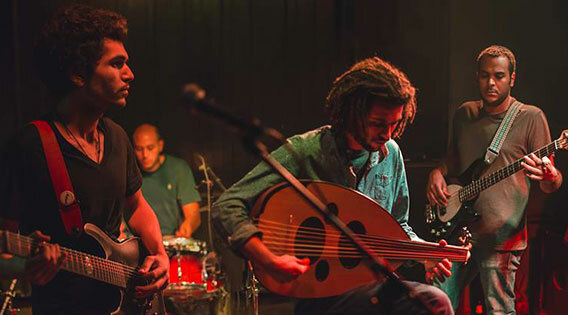 Cairo Jazz Club kicks off its weekend with a Thursday night of live music that will see singer-songwriter, Hassan Ramzy, who debuts his new band formation, The F.A.M. Other concerts across Cairo, meanwhile, including indie singer, Shaira Kamel, taking to stage at Darb 1718’s Mazzika X El Sat7, while Swedish collective, Tarabband, perform the first of two gig this weekend at El Genaina Theatre. Elsewhere, Goethe Institut and Cairo Contemporary Music Days team up for the first edition of Carte Blanche – a night that will welcome musicians from across the world for an eclectic night of music. Garden City’s ROOM Art Space, meanwhile, kicks off its weekend The Gypsy Jazz Project. But if music at the hands of a DJ is what you seek, Zigzag hosts Aly B and Nosrat for this week’s edition of House Night, while party-pusher, La Fete, kicks off the summer season with Dancing Along the Nile aboard the Diamond Boat in Maadi with Hassan Abou Alam and Aroussi among the DJs set to provide the music. Elsewhere, DJ AK is taking Wunder Kind to Funky Town and Graffiti hosts another night of all things retro with Disco Zaman, while Al Hezb El Comedy return to 3elbt Alwan with a host of stand-ups in tow. Friday is busy from beginning to end, with things starting the eighth edition of Cairo Fashion Festival proper kicking off two days of runways, shopping and entertainment at Cairo Festival City, while special bunches are aplenty – there’s the Big Friday Brunch at Night & Day, Friday Brunch at Fayruz and also at the Kempinski Nile Hotel. Thing heat up later on in the evening at Cairo Jazz Club, meanwhile, where Vega, Special K and Omar Sherif make up the Friday Fever line-up, while Zigzag welcomes Pacha Sharm resident, Ouzo, and sibling duo, Gawdat, to the stage. Elsewhere on the nightlife front, Aguzi & Fahim are in charge of the music at The Tap East, but if you’re looking for typical Oriental, hip-shaking fun, look no further than Wunder Kind, where shaabi singer, Ahmed Shiba, and belly-dancer, Luna, perform. Live music, meanwhile, can be found at Underground, where Alexandrian fusion band, Sorour Project, take to the stage, as well as The Tap Maadi, where Coldplay cover band, Strawberry Swing, return, and Bab 18, where local trio, Strings & Kicks, perform. Away from music, meanwhile, Darb 1718 hosts a screening of Mzung’s Sleeping in the City – a visual exploration of the modern urban cities. Saturday is a little quieter, but there’s still plenty to get your teeth stuck into – quite literally if you’re an early riser, as The Tap East hosts another of its Let’s Get Stuff’d afternoon food gorge. At the other end of the nutritional scale, the second Bazarna Food Market at Downtown Katameya Mall is bringing together all kinds of healthy, local, fresh foods under one roof. In the evening, as the dread of returning to work the next day begins to seep in, eclectic local band, Dokkan, end the weekend in style at Cairo Jazz Club, while a night of jazz awaits at The Tap Maadi courtesy of seasoned musician, Adam Miller. Elsewhere, Tarabband are back at El Genaina Theatre for their second performance of the weekend, while increasingly popular singing duo, Gramophone, wind down the weekend at Riverside in Zamalek. Maadi bar, Cheers, meanwhile, asks you to leave any inhibitions at the door for its Saturday Karaoke Night, while LIV Lounge hosts the debut of new party series, Unleash, where Mr. T (no, not that Mr. T) and AM!RA, taking to the stage. In terms of the art, there’s plenty to see across the city’s galleries, including Under the Sun at Art Corner, Zamalek Art Gallery’s 100th birthday tribute exhibition for the legendary Gamal El Sagini, and the very unique Via Aurelia at Gallery Misr. This is just a snapshot of the events taking place across the capital this weekend – check out the Cairo 360 events calendar for more!